I've been getting requests for some sort of gift guide...whilst contemplating whether to do one post with a montage of glorious goodies or spoon feed you with dribs and drabs of festive findings, I keep finding objects that are just too special to stuff in a stocking. 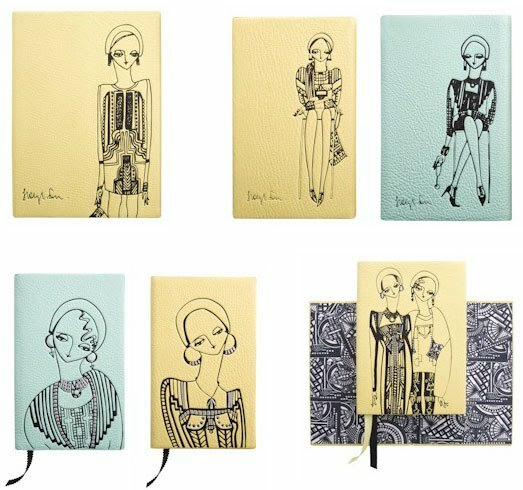 Namely, these beautiful notebooks and diaries by Scottish designer, Holly Fulton for Smythson. You may have noticed that I have a thing for stationery items especially of the notebook variety but these are yellow and blue goatskin, die-stamped, deco-inspired, illustrated, pieces of art! Not only that but Holly Fulton was born and bred in Edinburgh. Holly studied at Edinburgh College of Art before heading south to The Royal to do an MA. She graduated in 2007 and since then her collections have gone from strength to strengh. Her Art Deco and Bauhaus inspied work is incredible. Yay, for home grown uber-talent!